The rat kept crawling over Phekan Manjhi’s arm as he battled to pin it to the ground before he eventually managed to kill it with repeated blows to the head. The execution drew applause from neighbors huddled around the 60-year-old in a grimy courtyard outside his mud and straw hut. Another meal lined up for the Rat Eaters-some of India’s poorest people. Phekan said it would take 15 minutes to prepare the rat stew, as he dissected the animal with his fingernails. “Almost everyone here loves this and knows how it’s prepared,” he added. Phekan is one of about 2.5 million Musahars-‘Rat Eaters’-one of India’s most marginalized communities. Even the browbeaten low-caste Dalits look down on them. “They are the poorest amongst the poorest and rarely hear about or get access to government schemes,” said Sudha Varghese, who spent three-decades working among Musahars in the northern state of Bihar, where most live and survive as dollar-a-day laborers. “It’s a daily struggle for the next meal and diseases like leprosy are an everyday reality,” added Varghese, who was awarded India’s top civilian honor for her work. Phekan’s neighbor in the village of Alampur Gonpura, 28-year-old Rakesh Manjhi, bemoaned his life. “We sit at home all day with nothing to do. Some days we get work at the farm, on other days we go hungry or catch rats and eat it with whatever little grain we can get,” Rakesh said. “Governments may have changed but nothing has changed for us. 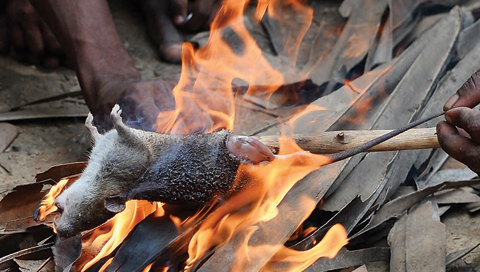 We still eat, live and sleep as our ancestors,” said Phekan as he took the roasted rat off the fire and poked the tender meat. He cut the flesh with his hands into a bowl and added mustard oil and salt. The feast disappeared in seconds as a dozen men and half-naked children grabbed what they could. “Nothing but education can change our lives and future,” said Jitan Ram Manjhi, who in 2014 became the first Musahar chief minister of any Indian state. His nine-month tenure heading Bihar, one of India’s most populous states, is considered a huge achievement for the Musahars. “My community is so downtrodden that I think even government records don’t yet show its real numbers, which could easily be around eight million,” Jitan Ram added. As a child, the former minister herded cattle for a rich landowner who employed his parents as laborers. “They were almost like bonded laborers, getting one kilogram of grain for each day’s work. Even today, things haven’t changed much for many,” he added. Well-intentioned programs are often privately-run-like the Shoshit Samadhan Kendra residential school for Musahar boys on the outskirts of the state capital Putna. “I started the school around a decade back with only four students and today it has 430, from remote Musahar communities across the state,” founder JK Sinha told AFP. He discovered how Musahars live while on a police raid as a young officer four decades ago. “They were cramped in a small hut with pigs and the filth. It was shocking. Inhumane. I can’t forget it,” Sinha said. RU Khan, the school principal, said the Musahars face discrimination, seclusion and squalor wherever they gather. “Most still only work as farm laborers who are forced to catch rats or snails in fields and scavenge for grain if the crop fails,” Khan said. Out of 430 pupils at Shoshit Samadhan Kendra, 117 lost their fathers at an early age. “Once here, it takes us at least a month to teach them the most basic personal and social skills-like using toilets, personal hygiene, washing hands or eating food,” Khan said. The regular education only starts after. But once given a chance, the boys are proud to get the opportunity to improve their lives. Bihar’s Welfare Department Minister Ramesh Rishidev insisted that life has improved for the Musahars. “We’ve been working hard with the different communities, which includes the Musahars,” the minister said. “Our workers go to the communities to get their young enrolled in schools. They are linked to government skills and training projects to get them employment opportunities,” he added.